I found myself in Duke hospital with my neck dislocated and broken from a football injury that afternoon. I was quarterback for the Duke University freshman team, with hopes of one day playing football professionally. My young dream ended that day and my life took a different direction. During those several years of recovery my father encouraged me to see a friend of his who was a Chiropractor. I was still having a great deal of problems from my injury, so I went. I was very nervous about that first chiropractic treatment, but you know, it didn’t hurt. In fact I actually felt good and everything got tremendously better. It worked so well, I decided to go to chiropractic school myself! After completing his education at Duke University, Dr. Smith was accepted to Palmer College of Chiropractic in Davenport, Iowa. During his four years at Palmer, courses included: biochemistry, a major emphasis on anatomy and human physiology, x-ray, diagnosis, chiropractic adjusting techniques, and patient care in the Palmer College Public Clinic. 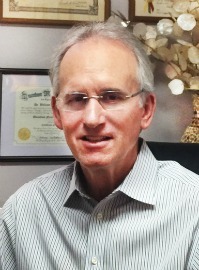 Dr. Smith is also certified in Clinical Acupuncture. Dr. Smith is married to Nancy and they have 3 daughters, Hannah, Alisa, and Katrina, son in law’s Wayne, David and Daniel, grandchildren Caleb, Wyatt, Kaylee, Kinley, and Malia. Everyone in the family including the grandchildren receives regular chiropractic care.